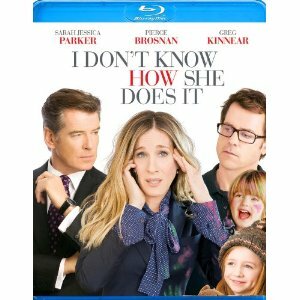 WorldMovieStore - I Don't Know How She Does It Sinopsis. Kate Reddy, played by Sarah Jessica Parker, could easily be Carrie Bradshaw's alternate life: a rising finance analyst, Kate feels guilty for short-changing her husband (Greg Kinnear) and two children. Men have realized the importance of family over work in dozens upon dozens of cookie-cutter heartwarming flicks; apparently it's time that women got the opportunity to do the same. --Bret Fetzer. Read More Sinopsis. 0 Response to "Blu-ray Release I Don't Know How She Does It"